No, this is not a bad 80s hair metal band. Guns and Hoses Foundation of North Texas is a nonprofit 501(c)3 foundation primarily committed to providing support and financial assistance to families of fallen fire and police officers, who have lost their lives performing their duty. They also raises funds to benefit at-risk youth programs within our communities. Join me for this year's annual throw down to raise much needed funds for a great cause. 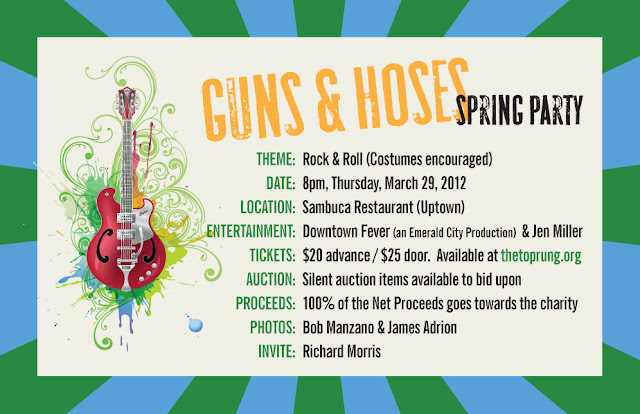 This year's theme is "Rock and Roll" so you could come as a bad 80s hair metal band... or Madonna. Whatever Rock and Roll is to you! The party will go down at Sambuca in Uptown, on March 29 with doors opening at 8PM. VIP tables and private areas are available, visit the website for more details on your options.